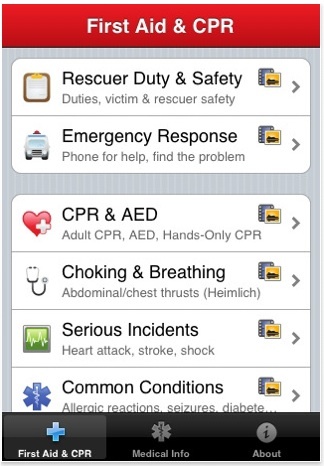 The Pocket First Aid & CPR app for the iPhone is being credited with helping to save the life of US filmmaker Dan Wooley. He was shooting a documentary on poverty in Haiti when the earthquake struck. Woolley is nearsighted and lost his glasses in the quake. But by using the focusing light on his camera and taking pictures, he was able to figure out where he was and where to go. And thanks to the iPhone first-aid app he’d downloaded, he knew how to fashion a bandage and tourniquet for his leg and to stop the bleeding from his head wound. The app also warned him not to fall asleep if he felt he was going into shock, so he set his cell phone’s alarm clock to go off every 20 minutes. Pocket First Aid and CPR includes hundreds of illustrated pages on topics like burns and emergencies and highly detailed videos showing how to deal with cuts and wounds. Although the iPhone does not actually treat wounds or injuries (yet! ), the idea that a portable device could provide medical assistance is the basic idea behind science-fictional devices like the autodoc from Larry Niven's 1970 novel Ringworld.